Quick blender pancakes are an amazing thing to have in your real food arsenal. These quick pancakes in the blender are also gluten free. Made with oats, bananas, yogurt, eggs, and other real food ingredients, your morning will be supercharged! Ahh, the smell of pancakes and coffee when you wake up… nothing else quite sparks that “cozy” feeling in the same way. Who doesn’t love pancakes – or any breakfast food, for that matter. But having a REAL cooked breakfast, especially on a busy morning, is a rare occurrence in our house! Our usual breakfast is usually a quick smoothie with cereal or toast. But, with this simple breakfast recipe for blender pancakes, a cooked breakfast is possible any day of the week. I was so excited about how easy, healthy, and TASTY these blender pancakes turned out! They are gluten-free and need no sugar, since the bananas act as a natural sweetener. 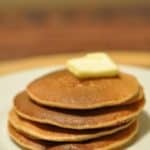 The batter for these blender pancakes can be whipped up in a matter of a few minutes, and cooking them on an electric griddle makes it even quicker. We like this ceramic one that’s teflon free. 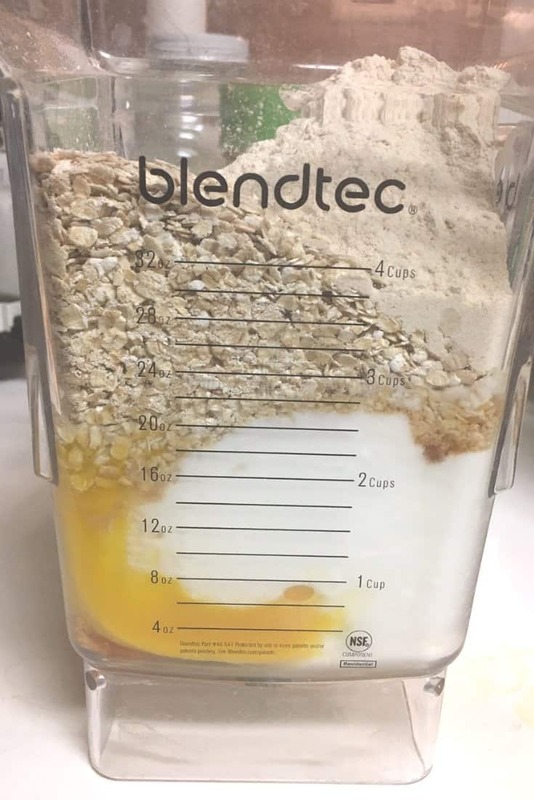 The blender we love using is made by Blendtec. It’s a high-powered one that can do absolutely everything and grinds the oats super fine. I also love the ease of pouring the batter out of the four side jar onto the griddle. Needless to say, we’ve been having cooked breakfasts a lot more often in our house! It’s also a great recipe when you need a fast dinner with some bacon on the side. Mama friends, this will save you some serious time! Here are the nutritious ingredients we are using for this easy pancake recipe. Each of these contribute some serious energy-boosting qualities! Oatmeal – The oatmeal grinds to a fine powder in the blender and creates the perfect gluten free flour substitute. Oats are a great complex carbohydrate, providing energy and nutrients like phosphorus, Thiamine, and iron (source). Bananas – The perfect amount of sweetness in this pancake recipe comes from bananas. They are an awesome source of energy as they are a healthy starch, and provide nutrients like potassium, B6, and magnesium (source). 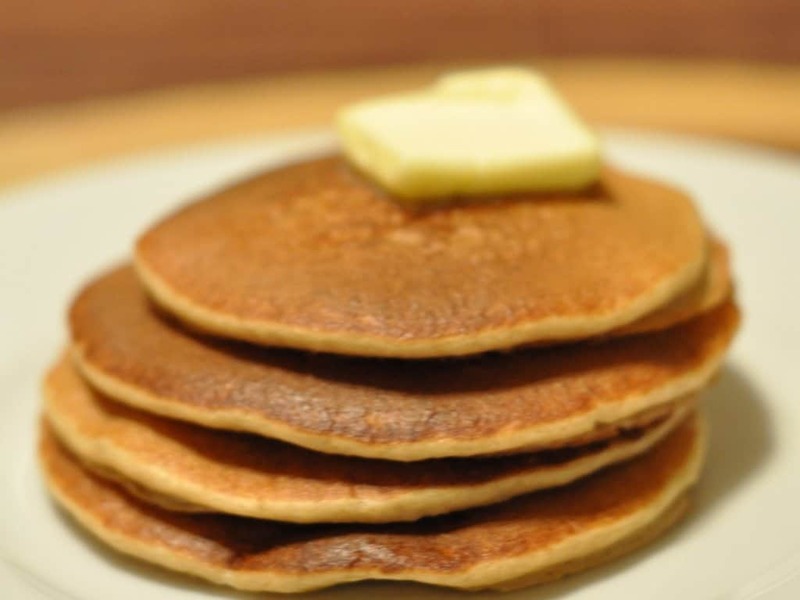 Cinnamon – This gives a nice flavor to these pancakes and compliments the banana well. Not only is cinnamon delicious, it’s also amazing for oral health, skin health, allergies, and also inflammation and blood sugar stabilization (source). Eggs – This recipe includes 3 eggs, which is pretty substantial and adds a hefty dose of protein. Eggs are an amazing food based source of vitamin D as well as B6, B12, zinc, iron, and more (source)! A serious nutrition powerhouse. Yogurt – In this recipe, yogurt thickens the pancake batter and adds protein. Yogurt also has an insane amount of vitamin B12 (source), as well as calcium. You may use greek or plain yogurt (we like the full fat kind). Milk – You may use any type of milk for this recipe: cow, coconut, almond, cashew, etc. Update: I’ve played around with this recipe a little bit and found that if you miss the fluffy pancake texture, you can substitute one cup of healthy flour (this kind is great) for one cup of the oats. My husband likes it this way better, but I think both versions are delish. You can also add any additions of your choice like blueberries, chocolate chips (my fave), etc. 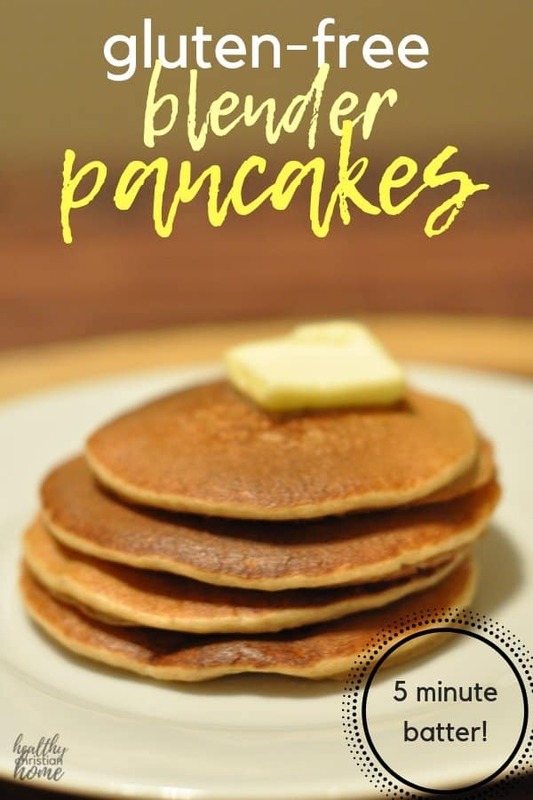 These blender pancakes are so simple to whip up, and are filled with healthy ingredients like oats, bananas, eggs, and yogurt! Heat and grease an electric griddle or skillet. Add all the ingredients to a blender. I like adding the wet ingredients first – it makes for an easier blending experience. Blend on HIGH for 1 minute, or until the oats are ground up and all the ingredients are mixed smoothly. 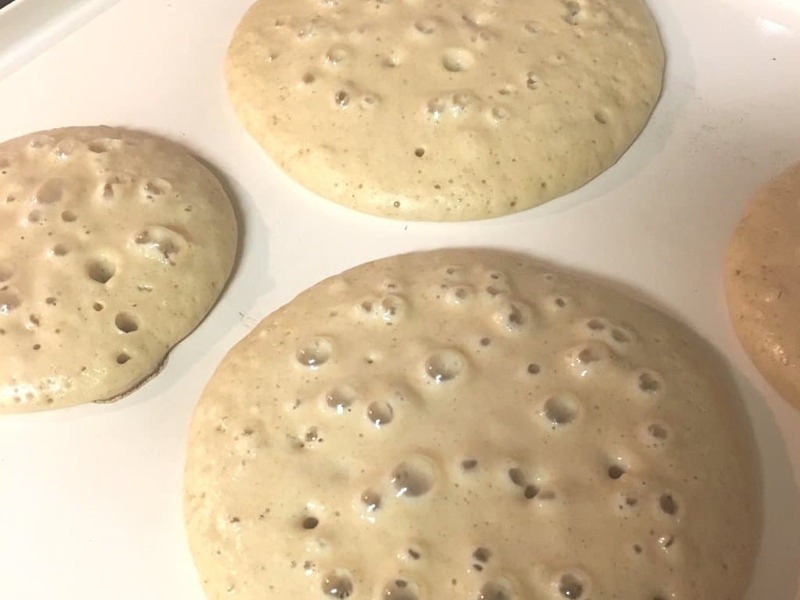 Cook pancakes, flipping after the bubbles form on one side. 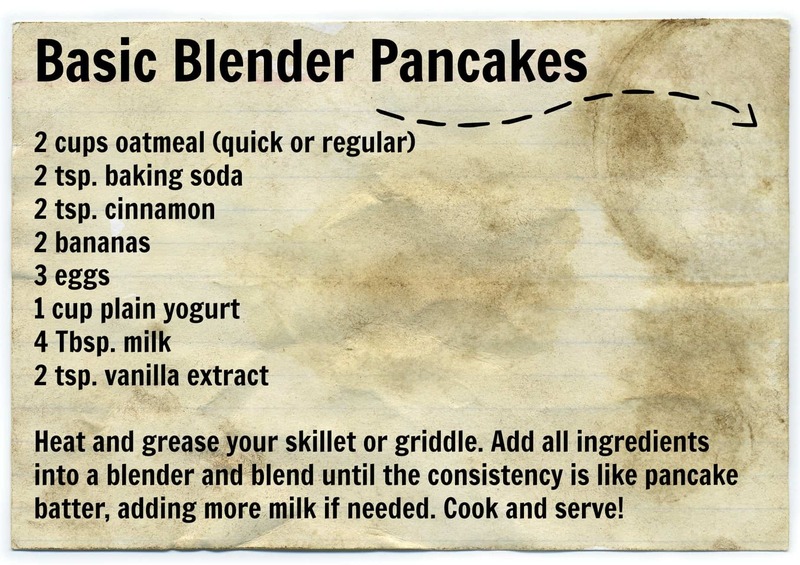 Here’s a list of a few yummy-sounding blender pancake variations! I’m game! Do you have any easy, quick breakfast recipes to share? Comment below!